Your little guy will be the talk of the party when he shows up wearing this adorable floral bow tie and leather suspenders set! 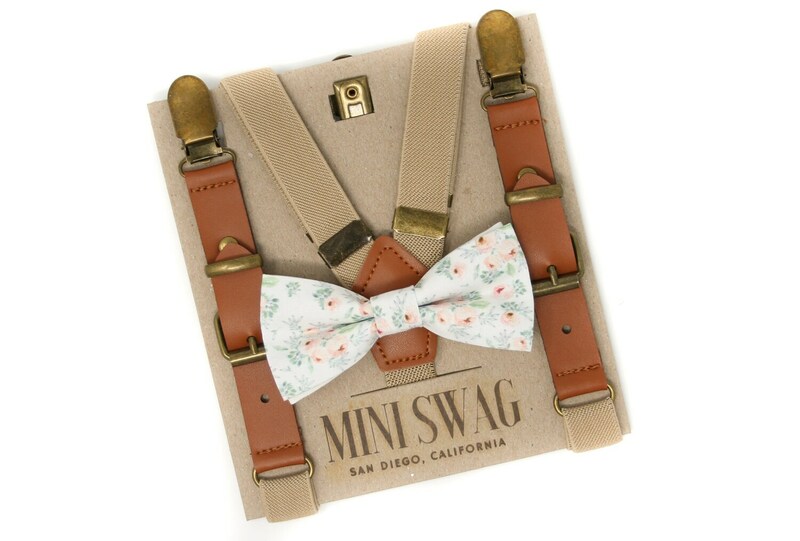 These khaki suspenders and coordinating bow tie are perfect for a ring bearer or page boy outfit, groomsmen, 1st birthday outfit, cake smash, wedding or other special occasion. This 100% cotton bow tie features a watercolor floral design in blush pink and sage. The bow ties come in 2 attachment options- on an alligator clip (best for squirmy little guys) or an adjustable elastic neckband (best for older kids). See images. Adult bow ties come on an adjustable fabric neckband.